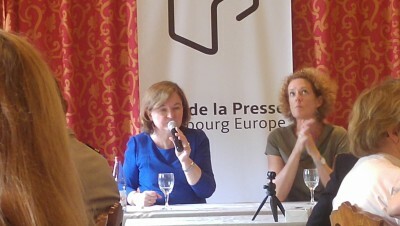 *Strasbourg/Press Club/Angelo Marcopolo/- Speaking to Strasbourg's Journalists, including "Eurofora", during a Press-Lunch organized Today Noon by the Press-Club of Strasbourg/Europe, the New French State Secretary for EU Affairs, Nathalie Loiseau, ensured that the Movement of EU Citizens' "Public Consultations on Europe's Future", wished by new French President Emmanuel Macron, is currently Spreading in "All EU Member Countries". - With the "Only Exception" of "the UK, Because of BREXIT", as she pointed out, (while, in fact, Hungary, finally, seems to participate, contrary to initial reports about a refusal, but focusing on a Different kind of Public Debates/Consultations on Europe's Future, at a Similar Time-Frame, including in a "Visegrad" Countries' format, as it results from other sources). - The main Point is that, Until Now, EU Citizens were, routinely Called to Express their Views "Only on Election-time" (i.e. Once in 5 Years), "or on a Referendum", she Reminded. - But, on the Latter case, the "Questions" Really raised were usually "Complexe", while "the Reply" should be "Only a Yes, or a No". => Therefore, those Well Known Results, which had Upset Europe, and Delayed EU Integration, (I.e., in particular, Since Turkey's Controversial and UnPopular EU Bid, After 1999-2004, those 3 Famous "No" from a Majority of People, in France, the Netherlands and in Ireland, between 2005-2007, which notoriously Affected a Draft EU Constitution then). >>> In Fact, soon after that, at least for some, "the Fear of Referendums, had been Transformed into a Fear of the People", (with Obvious Anti-Democratic Risks, etc), and this Has to Change, the New French EU Affairs v.Minister Explained in substance. - So, Now, When a Time comes to ReStructure and ReNovate the EU - as even EU Heads of State/Government have Decided, in Principle, especially at their Post-BREXIT Summits at Bratislava, 9/2016 and Rome on 3/2017 (See "Eurofora"'s NewsReports from the spot, in Bratislava and Rome, respectively, at: http://www.eurofora.net/newsflashes/news/bratislavasummitoutcome.html + http://www.eurofora.net/newsflashes/news/euromesummitonfuture.html , etc)- then, "we Need to Know which are the Priorities of the Population", she stressed. - The above-mentioned Europe-Wide Movement for Public Consultations, is due to take place "from April up to the End of October 2018", she reminded, speaking at the End of May in Strasbourg, almost 1,5 Month after Macron officially Launched the 1st such EU Citizens' Consultation on 17 April 2018, set up by Loiseau's Staff at Nearby Epinal City, on the Vosges' Mountains, (See "Eurofora"s NewsReport from the spot, at Epinal : http://www.eurofora.net/newsflashes/news/macronlauncheseucitizenconsultations.html + http://www.eurofora.net/newsflashes/news/macronlsongmarchtoconsulciti.html). + Adding "European" Flavour, Brussels' Headquartered EU Commission is Helping such moves, particularly with "an EU-wide Enquiry", published "On-Line", at its own Website, "since the 9th of May" 2018, the French deputy Minister observed. That Parallel move is made on the Basis of "a Questionaire established by a Panel" of people "Chosen by Drawing Lots", as she pointed out, (speaking of a Group of Persons Invited Earlier to Brussels for 2 or 3 Days, earlier on). 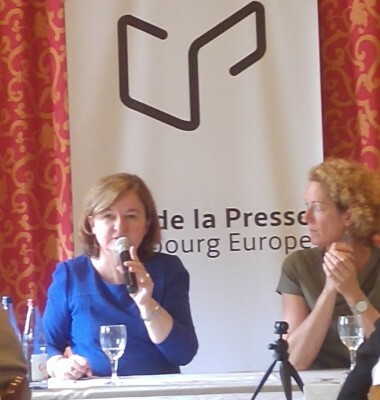 ++ Elsewhere in Europe, until now, the French v.Minister already "assisted personaly in 5" such Events, where I Opened the Process", as Loiseau said, including in Zagreb, already from April 6, Prague (earlier this May 2018, together with new Czech Prime Minister Andrej Babiš), at Madrid, and (nearby) Luxembourg, as well as in Berlin. ++ MEPs naturally could and should Participate, particularly in their respective Fields of activities, Each one where he/she Knows Best, while paying also Attention to have, as much as possible, a "Pluralist" Input from "All Sides" of the Political Spectrum, she advised. - EU Parliament's President, "Tajani Supports that", Loiseau went on to add, (Comp. President Tajani's relevant Reply to a somewhat Different, but Relevant "Eurofora"s Question at his Press Conference during the December 2017 EU Summit in Brussels, at : http://www.eurofora.net/newsflashes/news/euparliamentpresidenttajanioncitizensdebates.html), while also pointing, Meanwhile, also to the forthcoming Annual Meeting of EU Young People at the European Parliament, (usually nicknamed "EYE"), where "a Part will be consecrated to Citizens' Consultations", as she said. That 2 Days Event, scheduled for Friday and Saturday, 1 and 2 June 2018, at EU Parliament's Building in Strasbourg, just after the current Plenary Session, and with the Participation of certain MEPs, as usual, among its Manifold Side-Events, contains, indeed, at least a 1,5 Hour-Long Meeting, on Saturday Afternoon, in the Louise Weiss' Tower's 3rd Floor, inside a 190-places wide Room, co-Organized by the European Movement's Youth section, as "Eurofora" read in the Official Program. - Concerning France, Loiseau said that the "Public Consultations" movement has Already Spread "throughout All the Territory" of the Country, "including even its Periphery Areas" ("DOM-TOM"), etc., with "around 200 Debates", out of which, she "assisted personaly on 20 among them", (i.e. 10%). - The French Government is Both "Organizing such Events, as well as Facilitating Others to also do so", the EU Affairs v. Minister reminded. - Other Organizers "could be, f.ex., Elected Politicians, Universities, Chambers of Commerce, Trade Unions, Associations, etc", Loiseau said, (Curiously forgetting or ommitting the Key Word : "by Citizens", while, on the Contrary, President Macron had Used it, including in the 1st such Public Consultation, when he Officially Launched the entire Process, at Nearby Epinal City, on the Vosges' Mountains, on April 17, 2018 : Comp. "Eurofora"'s NewsReport from the spot : http://www.eurofora.net/newsflashes/news/macronlauncheseucitizenconsultations.html). - The v. Minister also reminded that "there are 3 Conditions", for such a French Government's Help to other Organizers, regarding the "Pluralism, the Transparency" of such Events, "and a Restitution of their main Outcome", at their End, (i.e., around November 2018 at the latest). - For that purpose, the French Government can also "Support financially by Grants", those Other Organizers of EU Citizens' Public Consultations on Europe's Future, according to Public Administration's Decisions due to be taken by a specially Authorized Team, Loiseau added, while always insisting on the Political Pluralism of the overall Operation, officially due to "Involve Citizens from All Sides of Political Beliefs". "Eurofora", (which notoriously, and as even its own Name clearly indicates, supports a Similar, but not identical, Project, particularly, since, at the latest : +2006-2018), was Présent at the Official Launch of the 1st such EU Citizens' Consultation on Europe's Future by new French President Emmanuel Macron himself, on 17 April 2018, at nearby Epinal City, (See : ..., etc). Immediately After which, we had a chance to receive a direct Positive Answer of President Macron himself to our relevant Question about his eventual Political Will to Activate also those EU Lisbon Treaty Articles which can help Develop, even After 2019 EU Elections, (and using also the Possibilities offered by Internet Forums, E-Communications etc), Regular EU Citizens' Public Debates with EU Decision-Makers (including, f.ex. EU Parliament's MEPs, but also, perhaps, EU Council, EU Commission, etc) Before they Take Measures Affecting People's Lives and/or Society at large, (See: http://www.eurofora.net/newsflashes/news/macronforcitizensdebatesalsoafter2019.html , Exchange made on 18 April 2018, in Saint Dié City, at Vosges' Mountains !). Earlier, "Eurofora" has Published, inter alia, also Macron's landmark, relevant Speech at the Symbolic Rock of "Pnyx" facing Parthenon in Athens at the Historic Birth-place of Ancient Greek Civilisation's Direct Democracy, back on 9/2017 (See: http://www.eurofora.net/newsflashes/news/macronatthehistoricsourcesofdemocracy.html), and we also promoted a Question precisely on his Plans for EU Citizens' Consultations on Europe's Future during his Joint Franco-German Press Conference, Together with Chancelor Angie Merkel, at the Conclusion of the March 2018 EU Heads of State/Governments' Summit in Brussels, (See the French President's indirect but clear Reply, as given then at a subsequent occasion, in : http://www.eurofora.net/newsflashes/news/francogermanleadersappealtoeucitizens.html). I.e. something which was made more Clear in the Direct Reply that he Gave to Our Question, Afterwards, at Saint Dié on 18 April 2018, (Comp. Supra), in Addition to Following and Publishing also on Macron's relevant Declarations to MEPs at EU Parliament during the Morning of April 17, 2018 in Strasbourg, (See : http://www.eurofora.net/newsflashes/news/macronineuparliamentaskscitizensdebates.html , but also: ... ). Sarkozy stimulated by Irish "No" challenge : - "It's a call to change and build Europe otherwise. Not later, but now. It won't be easy, but it's fascinating !" 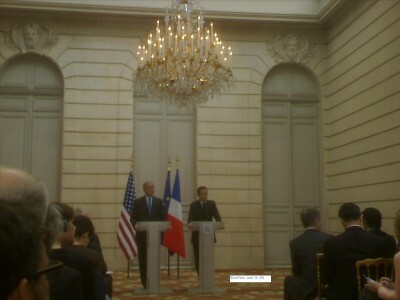 * Paris, Elysee, June 14, 2008. Forthcoming EU Chairman, French President Nikolas Sarkozy, created a surprise by declaring that the challenge of the Irish "No" to the EU Treaty, stimulates his belief that we must immediately change the way Europe is built. A difficult but fascinating task, that he intends to accomplish in the next 6 Months, during which he will analyse developments 3 times to EU Parliament in Strasbourg, on July, October and December 2008. First, the Franco-German position is that EU must make sure "that the Irish Incident does not become a Crisis". Ratification must continue, after 18 EU Member States, also to the rest, as UK Prime Minister Gordon Brown promised.